Hello my friends, I am back. Last week was a bit rough on me, you can read about it here, here, and here. Fortunately, my girls attended a wonderful Vacation Bible School featuring Panda Mania. More on that later...the school gave me some much needed breathing room. I used part of my free time shopping...thrift shopping to be specific, and found some fun finds. As many of you know, I am the quintessential pear shape, and like a vintage vibe, so where I found this skirt for $4.00, I had to get it. But, the most fab find was at a consignment shop in my fair city. It is a fit and flare dress that fits me like a dream, and looks like it came straight out of Mad Men. It will be great for a black tie event, my husband and I are going to in November, and will be perfect with my signature red high heel pumps, a gift Rick gave me on my 44th birthday. The dress was less than $30.00. Sometimes, girls just wanna have fun! Last month marked the first year anniversary of my new career of stay-at-home Mom. Since we adopted our oldest daughter from China five years ago, I knew I wanted to quit work. It nearly killed me to return to work after 12 weeks of maternity leave, yet I thought our family could not afford to live on one income. However, in the year since I quit my job, we have not burned through our emergency fund or gone into debt. How? We have learned to live on 60% less income. This is by no means a solution for every family. However, this is what worked for my family. Several of my friends have asked me about how we did it, so I thought I would share it with you all. This post was originally published in May 19, 2010. This week has been rainy and unseasonable cold for our part of the country. 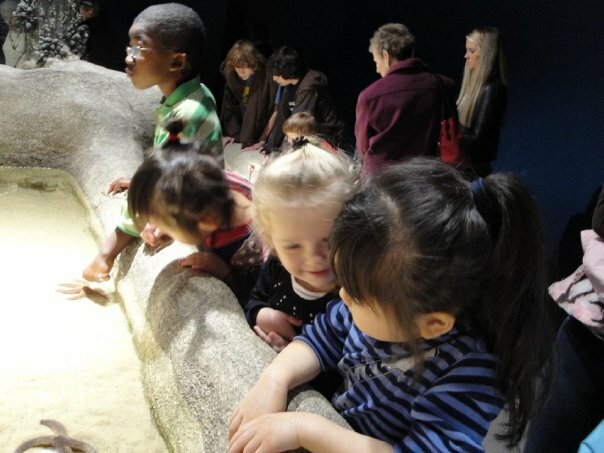 On Tuesday, my girls and I went to our local aquarium. You may ask, "I thought you just quit your job, how can you afford an expensive outing like that?". 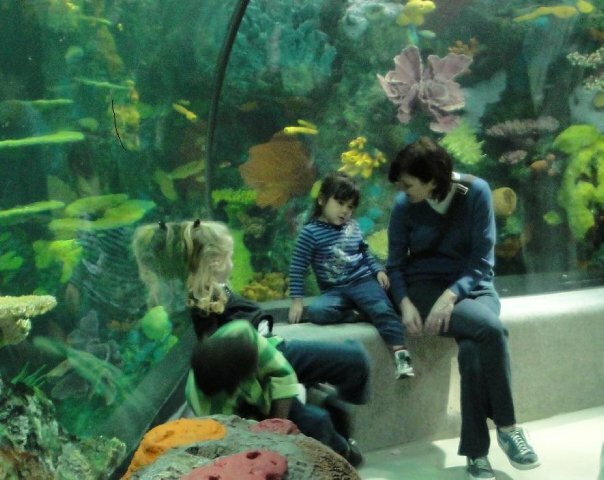 The answer is, the aquarium membership was given to my youngest by her paternal birth grandmother. "Gram" is a wonderfully generous woman who showers love and attention on both of my girls. She loves the environment and learning about the world around us, and wanted to share this gift with her granddaughter. I can honestly say, we have used the membership more times than I can count in the past six months. 1. Fevers, sinus infections, strep throats, we having a germ party at A Simple Twist of Faith this week. Fortunately, Ladybug is starting to feel better after four days of antibiotics. Bumblebee and my husband have beat the odds and remain healthy. As for me, today was the first day this week, I did not wake up with a splitting headache. I actually exercised this morning. HURRAH! 2.With my schedule in total disarray this week, I would like to share a post that really helped me. It was written by Jamie of Steady Mom on How to Balance Structure and Flexibility. 3. Due to the plague in my house, the girls have been watching a lot of movies. Ladybug's favorite this week is Meet Me in Saint Louis with Judy Garland. Margaret O' Brien co-starred as her five year old sisterd, Tootie. Have Youself a Merry Christmas was written for this movie. ﻿﻿﻿4. ﻿﻿Speaking of movies, I have a confeesion to make, I actually BOUGHT a DVD. On Sunday, I watched the season finale of Downton Abbey. I LOVED this series, and as I research it, I discovered that PBS heavily edited the original UK version. I found the unedited DVD on Amazon for $16.99 much less than the list price. 5. Thursday started the fifteen day celebration of the Chinese New Year. We are invited to a Lunar New Years Party this weekend, and I am hoping we are all well enough to attend. 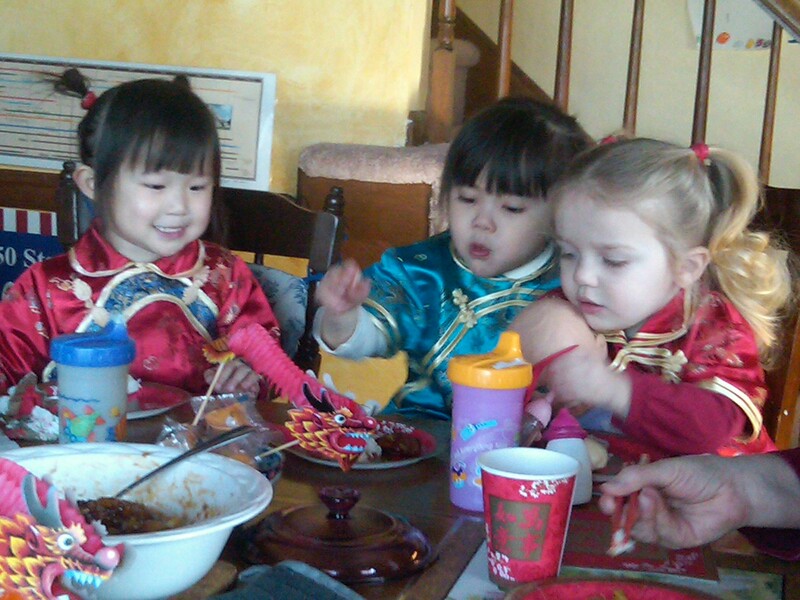 Here's a photo of my girls in their Chinese attire last year. It is amazing to see how much they have changed in one year. The days are long but the years are short. 6. I am no sports fan, I am more of the Masterpiece Theater type, see #4. However, next week, my Mom's prayer group will be studying chapter 3 of John. In preparing for the meeting, I stumbled across a controversy surrounding the upcoming Super Bowl. It appears Fox has rejected a Super Bowl ad featuring John 3:16. Perhaps, the Fox executives should continue reading John 3:17-21. 7. Well, I better go grocery shopping. Thanks to participating in the Pantry Challenge hosted by Life as Mom, I was under my grocery budget for the month of January. However, my cupboards are looking a little bare. For more Quick Takes, please join Jennifer at Conversion Diary. Today is the last day of January, and thus ends the Pantry Challenge hosted by Life As Mom. I thank all of you for sharing your recipes and encouraging me. With the extra attention and menu planning, I was able to feed my family of four on less than $100 per week and have leftovers. It's week four of the Pantry Challenge hosted by Life as Mom. Not only am I under budget, I had enough leftovers to freeze some meal-sized portions. I am at an advantage to other families, because my girls are small and don't eat as much as growing teenagers. However, I did host my friend and her three friend for lunch one day and brought a pot of chili and cornbread muffins to a potluck one night. We even took an extra trip to our local Chinese grocers. Welcome back the Pantry Challenge Week 3 hosted by Life As Mom. Are you cleaning out your pantry, how about your freezer? Due to limits in my storage and budget, I keep a sparse pantry and freezer, but I would like to share some great tasting recipes that will use up some staples and stretch a dollar. This week I bought 45 items and spent $94.24 which is under my $100 grocery and consumable budget I have for my family of four. I used coupons for coffee, cereal, and turkey sausage. The rest of my purchases were either perishables or generic items. Here's what cooking at my house! Welcome to week 2 of the Pantry Challenge hosted by Life As Mom. Last week, I invited you join me this month as I organize my kitchen, plan weekly menu plans, and start eating healthy again after a steady diet of Christmas cookies and other holiday treats. For some of you, this might mean cleaning out your pantry, planning meals or donating the excess. For me, it was about replenishing my pantry which was running low after weeks of Christmas baking and entertaining. All this I want to accomplish without going over my weekly budget of $100. I shop once a week at one "big box" location. Frankly, I rarely use coupons except for my beloved Eight O'Clock coffee. This week, I bought 42 items and my grocery bill was $94.67. Happy 2011! Here's a glimpse into my week. 1. 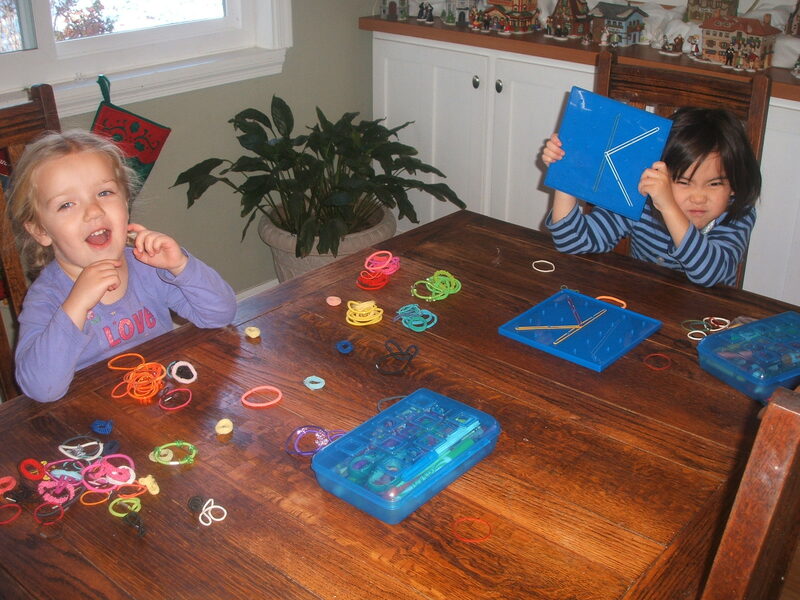 Monday, we were back on our home school schedule. I don't think my five-year old was ready to crack the books just yet...would do you think? 2. 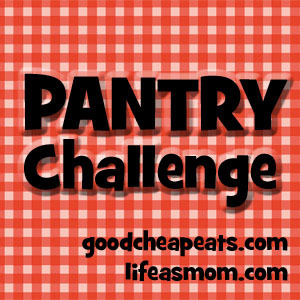 Tuesday, I joined the Pantry Challenge hosted by Life As Mom. I am looking forward to reducing my grocery bill and waistline as I choose low-cost healthy recipes and get organized in the kitchen. If you have a great recipe, please share it! Join me back here next week as I discuss my progress on the Pantry Challenge Week 2. 3. Wednesday, we have Chinese culture and language classes with our good friends. For the next few weeks we will be learning about Chinese New Year. Check out this really cool link that explains the fifteen days of Chinese New Year. My friend, Kathy, does a great job of preparing the curriculum and facilitating the instruction. I make cookies and coffee. At least, I know where my talents are! Here's some pictures from last year's celebrations. 4. Thursday, my Moms' Prayer Group also started back up after a break for Christmas. We will be studying the gospel of John. This week since we have not received the materials yet, I lead a discussion on "What is your Image of God?". 5. I don't know about you, but I am glad it is Friday. Today, I am taking a deep breath and rereading this post about surviving and thriving by Jennifer at the Conversion Diary 6. Saturday starts the Girl Scout Cookie Selling Season. My five-year old has staked her sales goal at 200 boxes of cookies. Her troop is trying to earn a t-shirt, a badge and a trip to a local indoor water park. 7. So, how many boxes of Girl Scout cookies would you like to buy ? Please join Jennifer at the Conversion Diary for more Quick Takes.